The short stocky Pug makes a very amiable companion and is a wonderful house dog! The Pug is a distinctive looking toy dog breed. It is short and stocky with an endearing wrinkled face. Its demeanor can be described as easy going and calm. Pugs are affectionate and loyal, and are usually happy. The Chinese Pug is very smart, but they can have a bit of stubborn strain. Provide them with firm but gentle training, and they will respond. They become very well behaved around children and visitors. They rarely have trouble getting along with other dogs or any other type of pet. When selecting a pug, be on the lookout for breathing and eye problems. 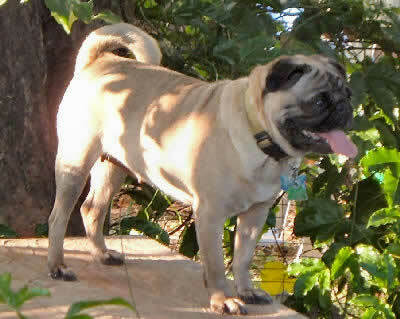 Breed Type The Pug is a toy breed that originated in China. Pugs are known for their sparkling personalities, and as with most toy breeds, they make good house dogs. Background The Pug is one of the oldest dog breeds in existence. Originally from China, the Pug is said to have been a favorite of Chinese emperors. It was brought to Europe by Dutch merchants. Pugs were used as military animals, guard dogs, and sometimes even scent hounds. Description Pugs are stocky, with round heads, flat muzzles, and deep wrinkles on their foreheads. They have large, protruding eyes and rose or button ears. Their coloring is either apricot, fawn, black, or silver, all with black muzzles and ears. Males are 12-14 inches tall and 13-20 pounds, and females are 10-12 inches tall and 13-18 pounds. Care and Feeding Foods that are low in protein and include beef, horse meat, and pork are best for pugs. A diet of fresh foods can help prevent flatulence. Care should be taken not to overfeed a pug, because they can easily become obese. Pugs should be brushed regularly and shampooed only when it becomes necessary. They must be dried quickly. The wrinkles on their faces require regular cleaning. Due to the Pug's tendency to develop allergies, it is advisable to keep its environment as clean as possible. Pugs are seasonal shedders, so regular vacuuming is necessary. Housing Your Dog Pugs need to be kept indoors, and fare best in moderate climates. They cannot tolerate extreme temperatures. They are not excessively active indoors, and they do not have to have a yard. Social Behaviors Pugs are very easy to get along with, and they enjoy the company of people and other animals. They do well with children. Pugs need plenty of attention, and they may get jealous if they do not get it. Handling and Training Pugs are very intelligent. They can, however, be stubborn at times. They respond best to gentle reprimands and positive reinforcement. Activities Pugs are not extremely active by nature. They do, however, need regular exercise to stay healthy. Daily walks and play sessions are advised. They may wheeze or become overheated if they overexert themselves, so it is important to keep a close eye on them. Breeding/Reproduction Pugs are prone to Pug Dog Encephalitis (PDE) and hemivertebrae, a spine deformity that can cause paralysis. Both conditions may be hereditary, so a careful check of bloodlines is imperative when selecting a mate for a Pug. Females often need Cesarean sections when whelping. Common Health Problems Pugs with PDE develop symptoms at 6 months to 3 years of age, and almost always die or require euthanization. Severe cases of hemivertebrae may make euthanization advisable as well. Pugs' respiratory systems make breathing problems common, but unless they are severe they do not require medical treatment. Availability Pugs can be purchased from breeders throughout the country. Prices vary, but they average $450 to $750. We have a loving 4 month old male Pug. He is lovable, playful, great with children (we have a 2 year old and 4 year old), outdoor trained, shots up to date (paperwork to show) and weighs almost 26 pounds. He is trained on eating and drinking at certain hours. He has been so good to us and we are saddened to finally make the decision on rehoming him. My husband and I were thinking of getting him another male dog to keep him company but we are unable to have a second pet in our rental, therefore we need him to have a family that will give him the attention he needs. We basically are with him some weekends due to work, and feel he needs more than that. He can't be an indoor dog due to out "renters contract" but is able to sleep in the garage. We have everything you need for him; a bed, 2 cages (size medium and large), toys, 2 sets of dog plates/bowls, a snow jacket and two sets of leashes. We own a black pug and she is a funny dog. She is stubborn but loving. She has some strange habits like she loves to sleep under a blanket. Sometimes we lose her then see a blanket walking across the floor. She has snoring issues which some people think she is growling. But she doesn't bark. She has had some allergy issues but nothing that can't be taken care of. We have 2 other large dogs and she holds her own with them. Pugs make a great inside dog. We have a rescue pug. We love her so much, she is the sweetest thing. We have had her about four years. When i leave or she does not see me she will start hollering. Everyone thinks shes saying mama cause it does sound like that. I would very much recommend rescuing one. You would not be disappointed.